I suppose I might change my mind, but after watching the President give in to the Boehner-McConnell blackmail axis, I don’t imagine I’ll be spending much of my time advocating his re-election. Assuming he’s the Democratic nominee, which I do, I’ll vote for Obama, because the alternative will still–somehow–be worse. But I really can’t see how, in good conscience, I could defend the economic policies of a guy who has signed on to fiscal contraction in the midst of a major downturn. And that’s leaving aside the President’s apparent lack of understanding of the importance of bargaining from strength. So much for all that poker expertise he’s supposed to have. I got into this relationship without any illusions about who you were. I never listened when others told me that you were perfect. I never listened when some told me you weren’t worth my time. I got together with you because I believed in us. You and me. Somewhere along the way, you stopped caring. Somewhere along the line, you started believing in others more than you believed in me. I loved you as a smart, principled man. I worked at this relationship. Even when we fought, I still sought out the good in you. Now, finally, after watching you have affair after affair, saying each time that it was just a one-time thing, I have to allow myself to feel bitter and angry and more than a little foolish. And I have to do that by myself. I’m sure many of my friends will be upset. “What are you going to do now?” they’ll say. “You’re not going to date Mitt or Michele, are you?” What that implies is that I should settle, that I should compromise myself and my dreams just to keep us together. No one deserves that kind of power. And they never considered a third option between staying with you and being with someone else. They never considered that I could just be alone. So this is a separation, and I’m sure you’ll be dating again quickly. But I need a break. I need to remember why I loved you. I need to miss you. I need to see if I miss you. Sure, sure, you’ll say, I’m being a drama queen, that nothing has changed, that I don’t live in the real world, that everything you’ve done has been for me, that I just don’t understand what it’s like to live with the pressure that you have. No, but I have to live with the results of what you do. And after you’re done, in 2013 or 2017, you’ll still be a rich moderate conservative and I’ll still be a middle-class liberal trying his best to clean up all the messes. When even Larry Summers gives up on you, it’s time to pack your bags. Which is undoubtedly what several of the more politically-aware appointees started doing around twenty-four hours ago, making getting anything done all the more improbable. It’s not a repeat of 1937. It’s closer to 1882. Economists who know their history, speak up. Tim Duy’s “simple model”: “0.6 and 0.7 percent, respectively, for the final two quarters of ,” and getting worse in 2012. Macroadvisers (h/t Brad DeLong): “a modest 0.1 percentage point of GDP growth in FY 2012,” with the damage to be done by the Gang of 12 “No Revenooers” to cause death and destruction as Obama prepares to leave for Bachmann-Perry Overdrive (the MA graphic shows about 1/8th of 1%). I can’t speak for anyone else, but I know which is the outlier in that set. If you claim the Federal Reserve Board is an independent entity, why do you argue that “a higher inflation target is a political nonstarter” (even while conceding that “economists have argued, with some logic, that the employment picture would be brighter if the Fed raised its target for inflation above 2 percent”)? 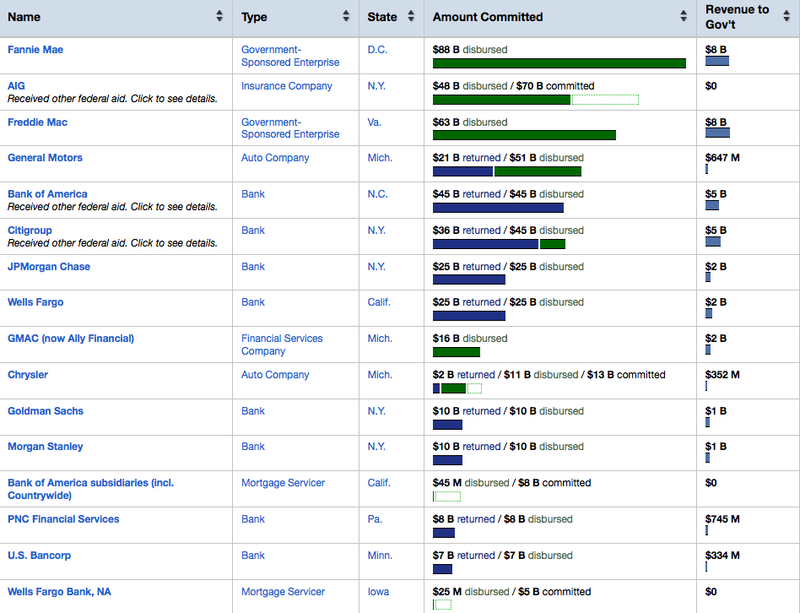 Pro Publica has been maintaining a list of bailout recipients, updating the amount lent versus what was repaid. So far, 938 Recipients have had $607,822,512,238 dollars committed to them, with $553,918,968,267 disbursed. Of that $554b disbursed, less than half — $220,782,546,084 — has been returned. Whenever you hear pronunciations of how much money the TARP is making, check back and look at this list. It shows the TARP is deeply underwater. This is actually good news, since everything else the Fed has done has been to benefit the insolvent large banks. Still, I didn’t expect my post of three days ago to be such a perfect “negative indicator” so soon. Fortune published an op-ed piece by Keith R. McCullough at Hedgeye (h/t to my Mom). He argues (not very well, I might add) that QE2 is the doomsday scenario for “markets”. I’d like to point out the following (mostly because this is a common mistake): what the Fed announced is NOT QE2. Furthermore, the Fed’s been considering investing options for months now, why the shock and awe treatment from markets? …the Committee will keep constant the Federal Reserve’s holdings of securities at their current level by reinvesting principal payments from agency debt and agency mortgage-backed securities in longer-term Treasury securities. The Fed announcement is NOT a second version of quantitative easing (QE2). Quantitative easing is a “super” policy response, where the Fed grows its balance through reserve creation and the purchase of (usually) government assets. The Fed is reinvesting the principal of maturing securities into longer-dated Treasuries from reserves already created. Therefore, the Fed is simply shifting the asset side of the balance sheet toward a Treasury-only portfolio. Reinvesting maturing Treasuries is regular practice for the Fed. No new quantitative easing. First, the Committee could consider halting all reinvestment of the proceeds of maturing securities. Such a strategy would shrink the size of the Federal Reserve’s balance sheet and reduce the quantity of reserve balances in the banking system gradually over time. Second, the Committee could reinvest the proceeds of maturing securities only in new issues of Treasury securities with relatively short maturities–bills only, or bills as well as coupon issues with terms of three years or less. This strategy would maintain the size of the Federal Reserve’s balance sheet but would reduce somewhat the average maturity of the portfolio and increase its liquidity. A few participants suggested selling MBS and using the proceeds to purchase Treasury securities of comparable duration, arguing that doing so would hasten the move toward a Treasury-securities-only portfolio without tightening financial conditions. So you see, the FOMC announcement to buy longer-dated Treasuries is not QE2; is not a surprise; and for reasons that I did not describe here, doesn’t portend economic collapse (see this policy brief, or the working paper, by Randy Wray and Yeva Nersisyan, where they refute the application of the Reinhart and Rogoff findings).